When you've just moved to London or are looking for a new area, it's hard to know if you're near the places that are important to you. Whether it's what parks you're near, what markets are closeby or how good the transport links are, we're here to help. So read on to find out the best spots around London if you want to be near a thriving high street. If you're looking for an area with a thriving high street of bars and restaurants, Clapham is the place. From Clapham Common all the way up to Clapham North, there's a plethora of amenities and places to eat, drink and socialize on Clapham High Street making it a great place to live if you've just moved to London and are looking to make some new friends. Check out properties for rent and for sale in Clapham here. Leyton and Leytonstone High Roads are fairly newly established - with more and more cafes, local shops and amenities opening along them. As people are moving further out of zone 1 and 2 for more affordable places to buy, new businesses are opening to cater for them within walking distance of the train stations and local areas. Check out properties for rent and for sale in Leyton here. A bustling high street, Roman Road starts in Bow and heads all the way into Bethnal Green on the route into Shoreditch and The City. Hosting a market three days a week, you can really experience East London in the fresh produce stalls, pie shops and local businesses on offer when you wander down Roman Road. Check out properties for rent and for sale in Bow and Bethnal Green here. At the heart of Battersea, Northcote Road is a hub of community activity. With many bars and eateries and plenty of businesses catering for young families, this is a thriving high street which is able to serve the local residents well. You'll find every business you need down on the high street and loads of new ones popping up too. Check out properties for rent and for sale in Battersea here. Dulwich is a relaxed area in which to live and Lordship Lane offers everything you need within easy reach if you live here. There's plenty of restaurants, coffee shops and local amenities, as well as small supermarket chains, banks and estate agents. With good transport links and Peckham Rye Park also within walking distance, Dulwich serves local needs easily. Check out properties for rent and for sale in Dulwich here. A busy road which heads into Hammersmith, King Street offers cafes, supermarkets and everything you need within easy reach of your home. You can head into Hammersmith itself for more variety of eateries and venues, but the high street here offers many handy amenities to keep you sorted day-to-day. Check out properties for rent and for sale in Hammersmith here. 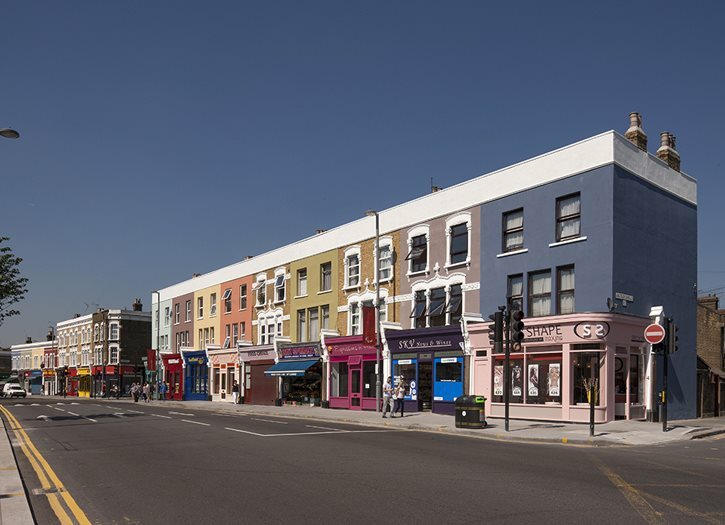 Running through the centre of Fulham, Fulham Road is a lovely high street offering a number of local businesses to residents here. The leafy area and slower pace of life are reflected in these friendly, locally run eateries, shops and amenities, making this a high street which serves your needs but is a pleasant area to explore. Check out properties for rent and for sale in Fulham here. A popular high street linking Angel to Highbury and Islington Overground Station, Upper Street offers plenty of attractions to locals. There's lots of snug coffee houses turned bars in the evening, plenty of interiors and clothing boutiques and several theatres and galleries to pop into on this busy road. Check out properties for rent and for sale in Islington here. Hoe Street has grown massively over the last few years - once home to many estate agents and takeaways, the road has plenty of new businesses who have moved in. There's a multi-complex cinema, plenty of new restaurants and pubs and its location next to the Underground and the bus station means this road is ever-popular with locals. Check out properties for rent and for sale in Walthamstow here. Probably the most famous on the list is Tottenham Court Road. Students and those looking to live centrally can benefit from the high street shops of Tottenham Court Road as well as the many of bars and eateries the surrounding neighbourhoods offer - making this a popular area to live close to which serves all your needs. Check out properties for rent and for sale in Central London here. Want to browse more of London? See what properties we have for sale and rent by area around London by clicking here now.